Tampa Bay&apos;s bike-share program, Coast Bike Share, got off to a strong start in its first six weeks of operations. Coast&apos;s program director, Eric Trull, said today his group signed up more than 1,100 members between mid-November and this week. The company&apos;s sky-blue bikes have traveled, collectively, 6,278 miles -- the distance from Tampa to San Francisco and back. The bulk of that pedaling has been around downtown Tampa, Ybor City, Davis Islands, Hyde Park and Bayshore Boulevard. 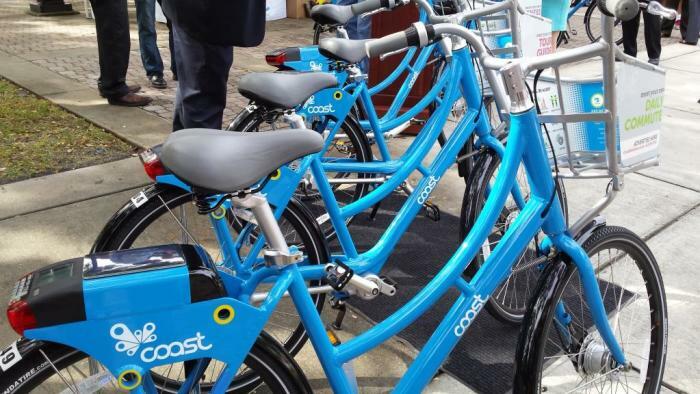 Coast Bike Share kicked off Nov. 17 with a members-only period. It opened bikes to the general public on Dec. 7. Memberships are $79 a year, but bikes are available on the spot to anyone with a credit card and a smartphone. You can get the free Social Bicycles app (they&apos;re the ones who built the bikes) for iPhone or Android. Each bike carries GPS and the technology to let riders rent a bike by their smartphone. When you&apos;re finished riding, just return the bike to one of the Coast stations and lock it back up. The bikes are built for city riding. They&apos;re sturdy, with baskets and an enclosed driveshaft instead of a greasy chain. One important note: In Florida, helmets are voluntary for anyone over 16, but mandatory for children under 16. Coast Bikes are BYOH, but City Bike Tampa, on Cass Street, will sell you one if you need one. Coast has 300 bikes on Tampa Bay&apos;s streets with plans for more in 2015. The bikes are stored at stations outside City Hall, Curtis Hixon Waterfront Park and other spots. They the perfect way to tour the Tampa Riverwalk or travel between downtown and popular neighborhoods like Ybor City. Bike lanes and bike paths separate riders from cars. They&apos;re also a great way to burn off lunch at one of Tampa Bay&apos;s great restaurants. Coast officials estimate their riders burned a total of 221,137 calories since the program launched.